Calibra Pictures financier–producer Kevin Farr (r) and writer–director Joshua Newton (l) received The Museum of Tolerance International Film Festival’s Remembrance Award for “Iron Cross.” They’re pictured here with Clint Eastwood, winner of MOTIFF’s Tolerance Award. “Iron Cross” star Alexander Newton (l) and writer–director Joshua Newton (r) were interviewed by Martin Grove after winning awards at the 2010 Boston Film Festival. Alexander was voted Best Young Actor and Joshua received the Visionary Filmmaker Award. 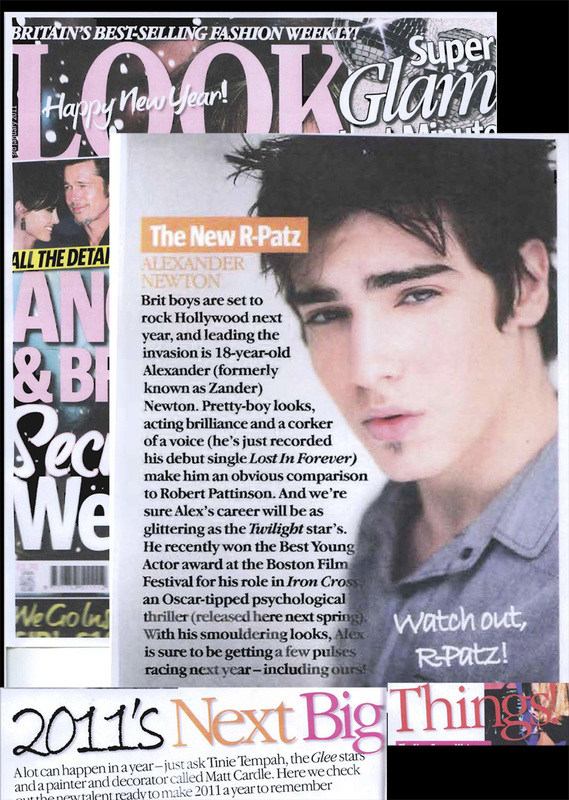 Alexander Newton, who stars in “The Bank Robbers,” was profiled recently in the British magazine LOOK. Click here to enlarge article. Word from Calibra Pictures that it’s putting writer–director Joshua Newton’s “The Bank Robbers” and “The Turning” into production in 2011 is good news for anyone who enjoys thrillers with a unique twist. Newton’s become known for coming up with twists that moviegoers just don’t see coming. His award winning thriller “Iron Cross” — which brought him the Boston Film Festival’s Visionary Filmmaker Award and the Museum of Tolerance International Film Festival’s Remembrance Award — ends, in fact, with a twist on a twist that leaves audiences with lots to talk about. When we spoke recently Newton shared some details about his next two pictures that Los Angeles and London based Calibra Pictures, financier–producer Kevin Farr and executive producers Alex Finney and Andrew Martin just greenlighted. Calibra, which has committed $250 million to ramping up production over the next two years, is fully financing both movies and will co–finance domestic p&a costs with their distributors. “‘The Bank Robbers’ is a unique youth appeal action film with a totally new approach to one of Hollywood’s most traditional genres,” Newton told me. “The Bank Robbers” will start production in New York in June and “The Turning” will shoot in London this fall. The male lead in both films will be 18–year old British actor/recording artist Alexander Newton, whose core audience of teen girls will be buzzing about both movies. Alexander, who’s Joshua’s son, made his feature debut opposite Roy Scheider in Calibra’s “Iron Cross.” Alexander was honored for that performance with the 2010 Boston Film Festival’s Best Young Actor award. Alexander was profiled recently in the British magazine LOOK’s special feature “2011’s Next Big Things” as a hot young international star to keep your eye on. Having seen him in action, they’re absolutely right!